A magnetic current is created from the movement of electrical current or vice versa (that is a magnetic field movement will create an electrical field). As such the two fields will continually move and continue to generate one another in the manner of a transverse wave. What Factors determine the type of Eletromagnetic Radiation? WAVELENGTH: the distance between two successive peaks or troughs within a wave. Measurements vary from kilometres (103 m) to less than one thousandth of a milimetre (<10-3 m). FREQUENCY: the number of waves created each second and is measured in hertz (Hz). Figure 1. Identifying wavelength using crests and troughs. 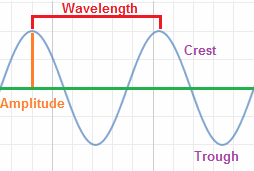 From Wavelength definition by Tutor Circle, 2018 (http://physics.tutorcircle.com/waves/wavelength.html). Copyright 2018 by Tutor Circle. Figure 2. 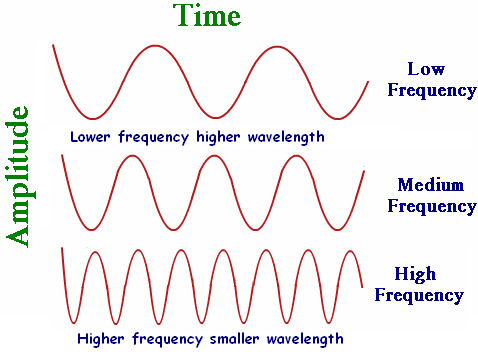 Relationship between frequency & wavelength. From How are frequency and wavelength related, by Tutor Circle, 2018 (http://physics.tutorcircle.com/waves/frequency-and-wavelength.html). Copyright 2018 by Tutor Circle. All electromagnetic waves do not require a medium in which to move and can travel through liquids, gases, empty space & some solids - high frequency/high energy radiation can pass through most solids, while low frequency/low energy radiation can be stopped by simple solids.